If you visit Fatahillah Square at Old City, Jakarta, you will be able to see a number of cannons in the corners of the park, but there is one cannon that is quite prominent namely the Jagur cannon. 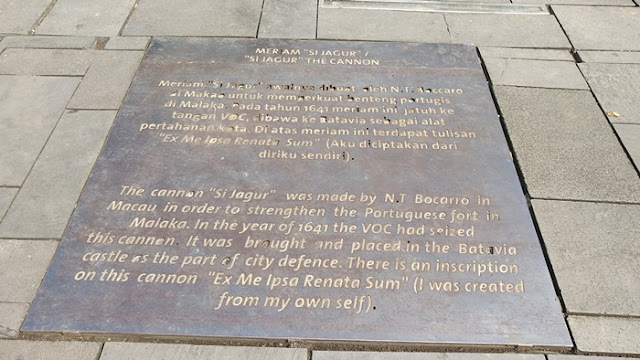 In the “Old City Tour : Jakarta From Sunda Kelapa to Glodok Pancoran” by Pradaningrum Mijarto (2013), it said that the bronze cannon with an inscription of ”ex me ipsa renata sum” is famously called ”Si Jagur”. The name of Si Jagur is thought as result of simplification of the name of the saint St. Jago de Barra. 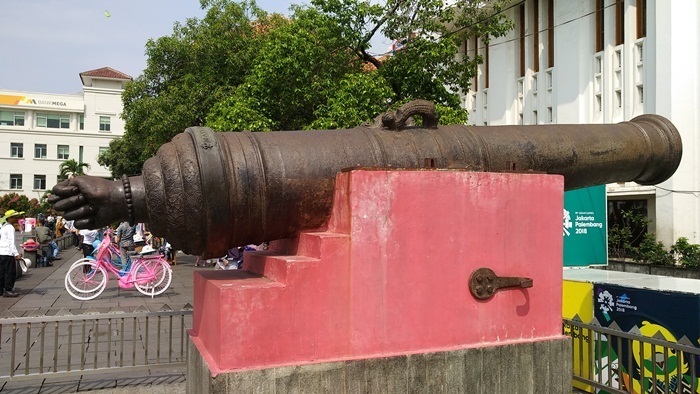 The Portuguese cannon was carried off to Batavia by the Dutch after Malacca fell in 1641, to be stationed at the Dutch citadel overlooking the port. The Latin inscription means “from myself I am reborn”. The sentence contains the code “XIV” (eX me Ipsa renata sVm) which indicates that the large cannon was forged out of 14 (XIV) smaller cannons. The cannon was forged in Macau by MT Bocarro for the Malacca Fortress. Another feature is the Mano in Fica (thumb in first) symbol, an ancient representation of copulation or sexual union. In Roman tradition, that symbol is associated with fertility and eroticism. Therefore a superstition grew around the cannon. Couples wishing for children would come to the cannon, sprinkle it with flowers and sit on the cannon. 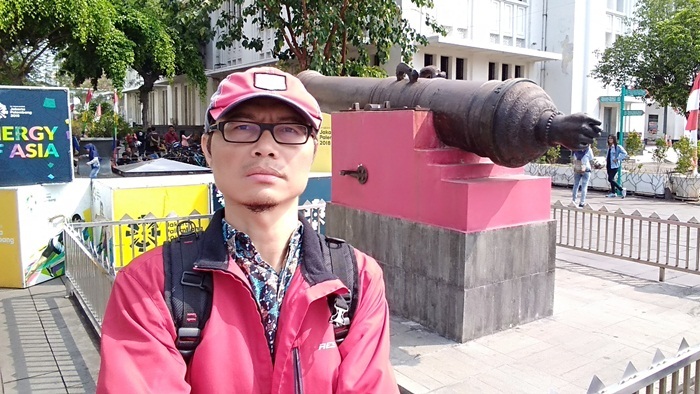 Now, the “Si Jagur” cannon stands between the Kantor Pos building and Gedoeng Jasindo building at Fatahillah Square, Jakarta.